Among the most familiar of all birds are the little brown ones that hop near our feet, searching for crumbs and seeds. Even most non-birders know that these unassuming creatures are called sparrows. They aren’t as colorful or charismatic as many other species of birds, but they are subtly beautiful and often diverse and abundant, so are worth a closer look! The most familiar and abundant sparrow species around NYC is not even native to our country: House Sparrows (formerly known as English Sparrows) were brought over from Europe in the 1800s. They have been transported worldwide by humans, and are now the most widespread bird in the world, generally associated with human settlement (hence the name House Sparrow). Ironically, they are declining in their native range in Europe, but seem to be maintaining their numbers just fine here in the US. House Sparrow (Passer domesticus) distribution. Dark green = natural range, light green = introduced range. Here in NYC, there are a number of native species of small, brown, ground-dwelling birds that are also called sparrows, although they are unrelated to the House Sparrow. These species are mostly migratory, and many pass through our area in the fall or overwinter here. 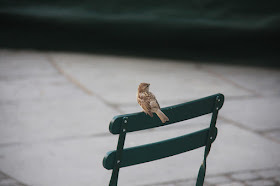 Bryant Park is a great place to look for some of these species, and to compare them with the ubiquitous House Sparrows. At first they can be difficult to distinguish. They are all small and brownish, with conical bills. The resemblance of our native sparrows to the House Sparrow is a great example of what’s known as convergent evolution: when unrelated creatures face similar selective pressures, they evolve similar characteristics. Dolphins resembling fish despite being mammals is a famous example. A streamlined body with fins is one of the best adaptive solutions to living & moving underwater (although there are entirely different evolutionary solutions, such as those of jellyfish or octopi). In the case of sparrow-like birds, they are mostly ground-feeders that eat seeds. Their thick bills are stronger than those of nectar or insect-eaters, since seeds often have tough hulls. They generally are brownish in color to blend in with fallen leaves or dead grasses, and often have streaks to provide further camouflage, since the ground is a vulnerable place to be (not too many ground-dwelling birds are brightly colored). 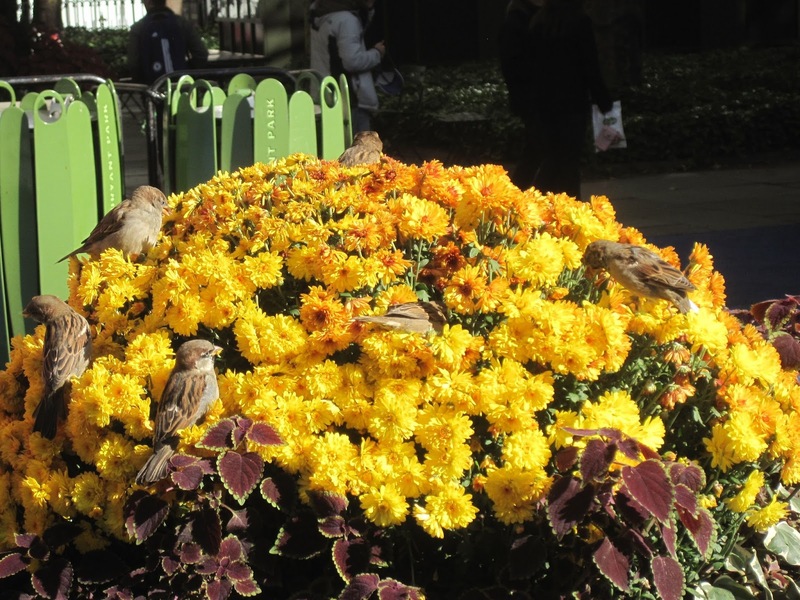 Sparrows congregate on seasonal mum displays. In their own earth-tone way, sparrows are a handsome group of birds, distinct from one another in shades of brown and tan, and patterns of streaks and stripes. Careful observation is rewarded! They might not catch the eye the way a Northern Cardinal or a Blue Jay does; I think it requires a certain measure of refinement and appreciation of subtlety to appreciate a sparrow. A good way to begin to pick out the native sparrow species is to spend some time in the morning or on your lunch break observing the sparrows in the park. The House Sparrows should be the most obvious & abundant species; if you are eating a scone or a sandwich, they will often gather near your feet or even hop on your table in search of crumbs. Study them to begin to discern the differences between the more colorful (relatively speaking) males and the nondescript, tan-colored females. Once you are thoroughly familiar with this species, you can begin to notice the native, migratory sparrows, which will more often be hopping around in the hedge rows and flower beds than under the tables (although sometimes they join the House Sparrows in search of bread crumbs). 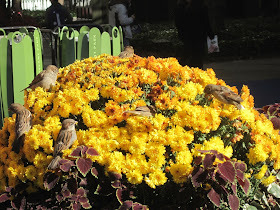 In part II of this post, I will explore some of the more common native sparrow species that can be found in Bryant Park, and how to tell them apart.